I am making a 4.5 dimensional game called Hypersurface. It is set in the three dimensional surface of a four dimensional hypercube (or tesseract). The game features a bizarre rendering engine that can view the same object from multiple angles at once due to the folding in 4D space. Meet me in real life and I will show you the tech demo. A bizarre reality-bending puzzle platformer where the concept of space and position are examined. I worked on this February-September 2016. It was written in C++ with SFML and Lua. Music is by Dustin van Wyk with the voice talents of Richard Taylor. This is a two vs. two social deduction card microgame. Check out the print-n-play cards, the rules and you can even purchase a printed copy. A retro puzzle action game. 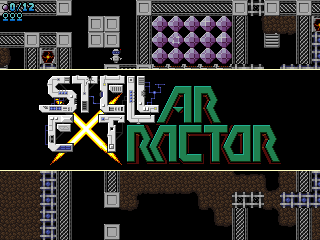 Adventure through space, fight robots, aliens and dangerous machinery, extract the loot and get out alive. This game is only for the most daring of space-adventurers. This was something I threw together in my spare time in 2011, after I had a vivid dream about it. It was written in C++ with SDL. Music is by AnEnemy productions. A twisty puzzle game where you have to restore a group of marbles in to their original state. Much like a 2D version of the popular Rubiks style puzzles. Written in C++ with Qt.